Rhodium has only recently been introduced to the precious metals market as an investment grade retail product that can be bought and sold in the way that physical gold and silver is traded. A member of the platinum group metals, rhodium is a much rarer metal than platinum or palladium. The price of Rhodium varies considerable, and has seen swings up to 10,000 USD / Oz. 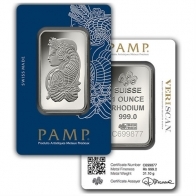 1 Ounce Rhodium bars are available for VAT-exempt storage in Switzerland and for worldwide delivery.